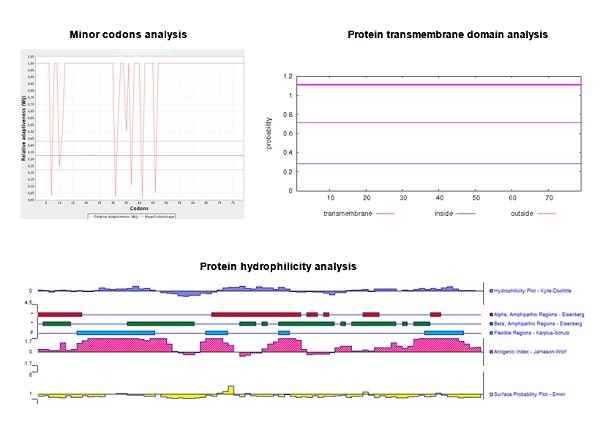 Prokaryotic protein expression system is the most common and economical method of protein expression available today, and E.coli expression syetem is one of the important and widely used prokaryotic protein expression system. Elabscience's E.coli Protein Expression System Service start with our proprietary codon optimization (S-CP-P001), followed by gene synthesis and sub cloning (S-CP-P002), protein expression and purification (S-CP-P003). 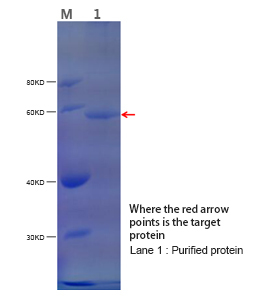 Besides, we can produce your target protein in large scale (1~5L, S-CP-P004 or 1~30L, S-CP-P005). High-quality and purified protein can be delivered to you in as short as 3~5 weeks from project initiation. You can order every single service or any combination of these services according to your project program. Submit your project information and requirements and place your order, our experienced experts will help with your research and promise you the high quality services with competitive price. Competitive price: Starting from $1,200. Short period: As short as 5 weeks. Guaranteed Package: 2~10 mg of purified proteins with a competitive price of $1,980. Flexible scale-up protein production: A wide variety of choices available (1L, 5L, 10L and 30L). One-stop service platform: Elabscience® can take your project directly from gene synthesis to downstream activities including recombinant protein expression,antibody production, and assay development. Prokaryotic expression and purification in very small quantities. Prokaryotic expression and purification in large scale. Ultra large amount of purified protein: We have fermentation tanks of 10L and 30L, thus high-purified protein up to gram level can be delivered within 4 weeks. 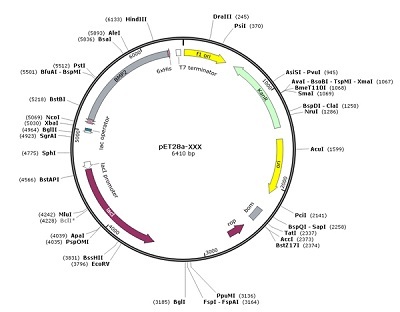 In this case, prokaryotic expression system was used. 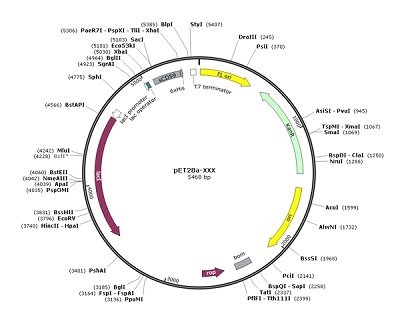 The recombinant plasmid was transformed to E.coli and the protein expression was analyzed by SDS-PAGE. 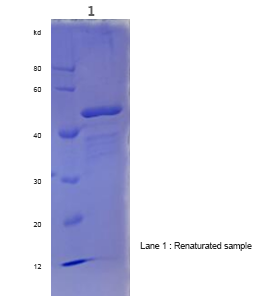 The Ni-column affinity purification method was used to get target protein. Any organization or individual may not reprint or misappropriate without the permission of Elabscience. The offender will be investigated for legal responsibility. Analyze the hydrophilic, surface antigenicity, etc according to protein sequence customer provided, choose the region to be expressed. 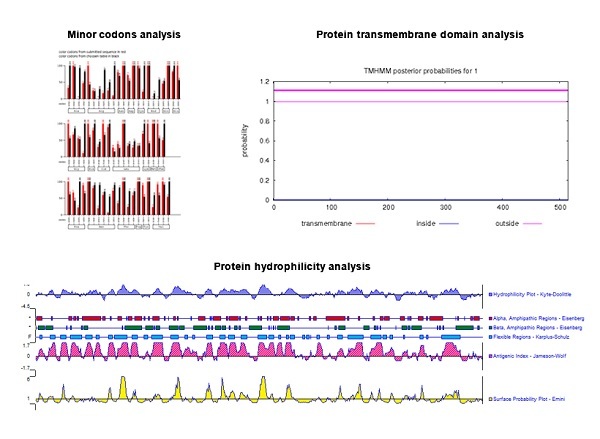 Optimize the codon of chosen region and develop a proposal with highest expression rate. Synthesize the optimized gene. 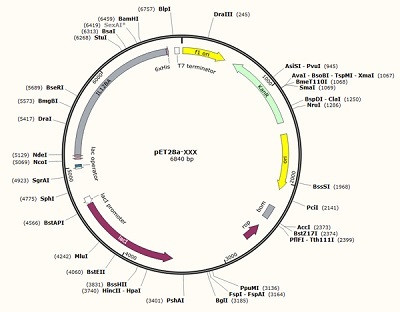 Digest the pET28a vector by Ncol enzyme and Xhol enzyme and link the gene to it, then select positive clones to sequence. a. Add 1 μL of plasmid to 100 μL of competent cell suspension, gently shake and mix fully, keep on ice bath for 30 min. b. Heat shock on 42℃ water bath for 90 s, keep on ice for 3 min, then add 800 μL of LB and keep at 37℃ for 45 min. c. Centrifuge at 12,000 g for 1 min, pipette 800 μL of supernatant, mix the remaining supernatant and bacteria again. d. Spread the remaining bacterium solution to selective solid medium containing kanamycin. Put the medium upside down the in 37℃ constant temperature incubator for 16 h after the bacterium solution was fully absorbed. a. Select individual bacterial colonies containing recombinant plasmid to inoculate in 5 mL of LB(contains kanamycin) medium, culture at 37℃ overnight. b. Take 1 sterile preservative tube containing 50% of glycerinum, add 700 μL of bacteria solution and reverse it to mix up. Store the tube at -80℃. c. Pipette 500 μL of bacteria solution to inoculate in 50 mL of LB medium, culture at 37℃ till OD600=0.6-0.8. d. Pipette 1 mL of uninduced bacteria solution to sterile 2 mL centrifuge tube as control. 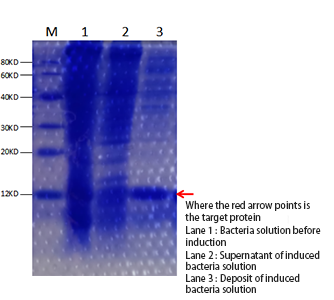 Add IPTG to the remaining bacteria solution to reach a final concentration 0.5 mM. Culture the bacteria solution at 30℃ for 5 h.
e. Pipette 1 mL of induced bacteria solution and uninduced bacteria solution respectively to centrifuge, re-dissolve with 500 μL of binding buffer. 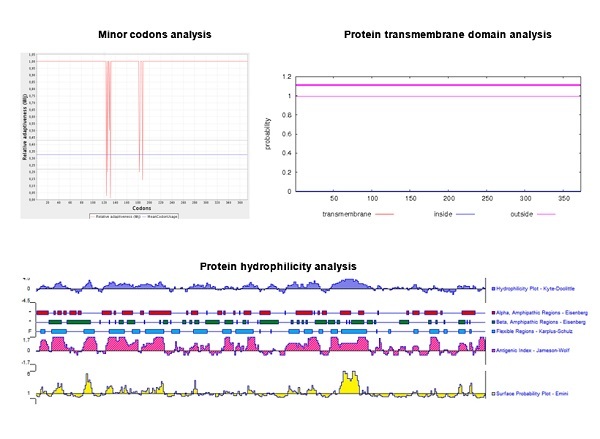 Analyze the protein by SDS-PAGE. a. Collect 300 mL of bacteria culture, centrifuge at 5000 rpm for 5 min. Re-dissolve with half binding buffer. b. Broken the bacteria by ultrasonication at 450 W for 30 min. c. Centrifuge at 12,000×g for 10 min. d. Re-dissolve the precipitation with one-tenth wash solution. e. Centrifuge at 12,000 ×g for 10 min, abandon the supernatant. f. Wash repetitively for 3 times. g. The purity of inclusion bodies was over 80% by SDS-PAGE determination. a. Dissolve the inclusion bodies in solution buffer. b. Centrifuge at 12,000 × g for 10 min, collect the supernatant. c. Add the supernatant to dialysis bag with appropriate pore diameter, put it to refolding buffer with 20 times volume, keep at 4℃ for 16 h.
d. Centrifuge at 12,000 × g for 10 min, collect the supernatant. Determine protein concentration by BCA method and protein purity by 15% SDS-PAGE. e. Freeze-dry protein: add protective agent to sample and freeze-try. a. Select individual bacterial colonies containing recombinant plasmid to inoculate in 5 mL of LB (contains kanamycin) medium, culture at 37℃ overnight. b. Take 1 sterile preservative tube containing 50% of glycerinum, add 700uL of bacteria solution and reverse it to mix up. Store the tube at -80℃. c. Centrifuge at 12,000 ×g for 10 min. b. Centrifuge at 12,000 ×g for 10 min, collect the supernatant. d. Centrifuge at 12,000 ×g for 10 min, collect the supernatant. 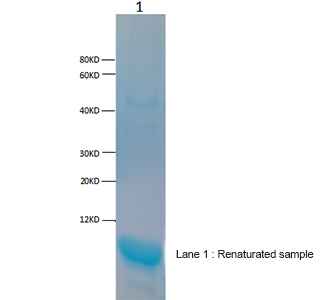 Determine protein concentration by BCA method and protein purity by 15% SDS-PAGE. In this case, expression vector was provided by customer. 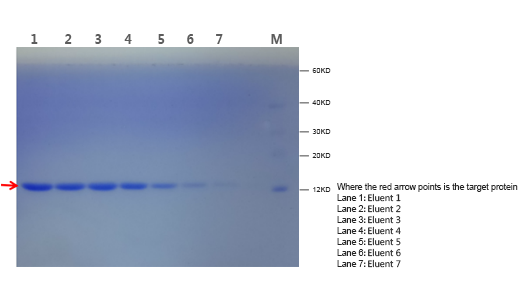 The protein expression was analyzed by SDS-PAGE and the Ni-column affinity purification method was used to get target protein. 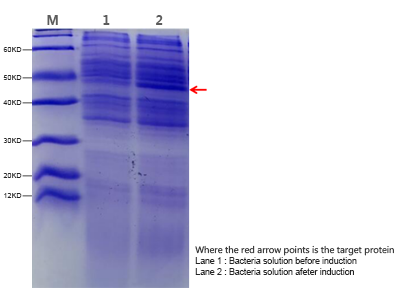 As the target protein was fused with GST tag, we purified the protein by Glutathione Sepharose and removed the tag by enzyme digestion, then purified again to get target protein. a. Pipette 10 μL of bacteria solution, spread on 5 mL of LB medium. Culture at 37℃ overnight. b. Take 1 sterile preservative tube containing 400 μL of 50% glycerinum, add 700 μL of bacteria solution and reverse it to mix up. Store the tube at -80℃. c. Inoculate the remaining bacteria solution in 300 mL of LB medium, culture at 37 ℃ till OD600=0.6-0.8. d. Add IPTG to a final concentration of 0.5 mM, Culture the induced and uninduced bacteria solution at 30℃ for 5h. 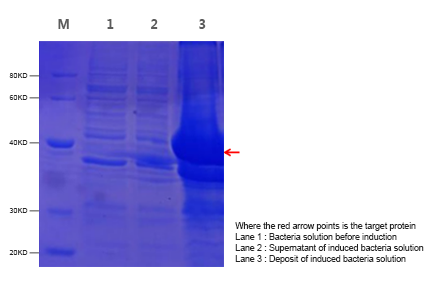 e. Collect uninduced and induced bacteria solution to analyze with 12% SDS-PAGE. a. Gently turn the Glutathione Sepharose upside down. b. Add 3 mL of resin to 10 mL of purification column. Keep the resin precipitating by gravity for 5~10 min. c. Wash the column with sterile distilled water(the volume is 3~5 times of column). d. Wash the column with binding buffer containing 5 mM of DTT (the volume is 3~5 times of column). e. Load sample (target protein less than 20 mg in the sample). Store the effluent at 4 ℃, analyze by SDS-PAGE. f. Wash the column with wash buffer (the volume is 3~5 times of column) till the effluent was identified no protein in by G250. Store the effluent at 4℃, analyze by SDS-PAGE. g. Elute target protein with elution buffer. h. Collect 1.5 mL of eluent in each tube till no protein was eluted off. i. Add the protein solution to dialysis bag, dialyze with PBS (pH=7.4) overnight. a. Add thrombin to protein sample. Enzyme digest at 37℃ for 20 min. b. Load the enzyme-digested product as outlined above. Collect the effluent. c. Analyze by 12% SDS-PAGE. c. Pipette 500 μL of bacteria solution to inoculate in 50mL of LB medium, culture at 37℃till OD600=0.6-0.8. 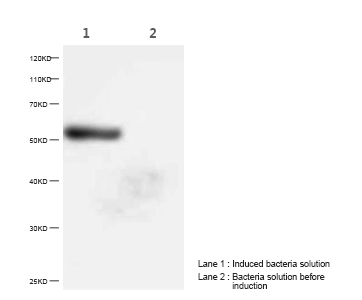 f. SDS-PAGE with uninduced and induced bacteria solution, transfer for 1.5 h to membrane, block with milk for 1 h, add anti-his-tag antibody and incubate at room temperature for 1 h. Wash with TBST 3 times, add secondary antibody and incubate for 1 h. Wash with TBST 3 times, then develop. a. Collect 300 mL of bacterial solution, centrifuge at 5000 rpm for 5 min. Re-dissolve it with one tenth volume of binding buffer. c. Centrifuge at 12,000 ×g for 10 min, transfer the supernatant to another container. Repeat this step. d. Take 40 μL of lysis and 40 μL of supernatant respectively to analyze by SDS-PAGE. e. Add 3mL of resin to 10 mL of purification column. Keep the resin precipitating by gravity for 5~10 min. f. Wash the column with sterile distilled water (the volume is 3~5 times of column). g. Wash the column with binding buffer (the volume is 3~5 times of column). 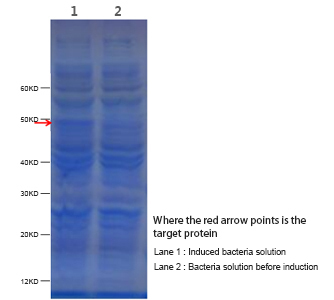 h. Load sample (target protein less than 20 mg in the sample).Store the effluent at 4℃, analyze by SDS-PAGE. i. Wash the column with wash buffer (the volume is 3~5 times of column). Store the effluent at 4℃, take sample to analyze by SDS-PAGE. j. Elute target protein with elution buffer. k. Collect 0.5 mL of eluent in each tube till no protein was eluted off. l. Add the protein solution to dialysis bag, dialyze with PBS(pH=7.4) overnight.